NuMedica Caprylic Acid is a popular supplement for people who want to improve the function and health of their digestive tract. Caprylic acid, sometimes known as octanoic acid is found naturally in breast milk and coconut milk. This unique fatty acid also offers other benefits to people who take it. As a trusted leader of the natural and nutritional supplement industry, NuMedica offers products that are regarded to be both effective and safe. If you suffer from intestinal complaints like indigestion or bloating, you might find that NuMedica Caprylic Acid will relieve these unpleasant symptoms for you and also provide other important benefits. Caprylic acid is an effective fighter of candida, a yeast-like fungus that can cause problems in the digestive tract when not held in check. An overgrowth of candida can result in abdominal bloating, diarrhea, constipation, and poor overall digestion. Caprylic acid can naturally combat this overgrowth by disrupting the cell membranes of candida, which effectively leads to their demise. 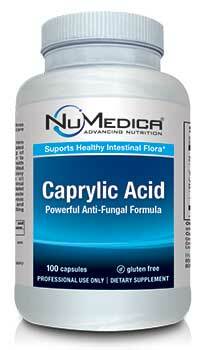 Caprylic acid controls the candida population in your gut without harming beneficial digestive microflora. Caprylic acid offers more benefits besides its ability to keep the digestive tract running smoothly. 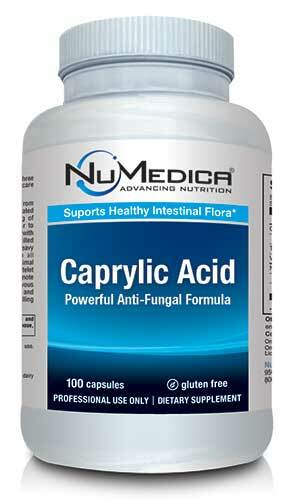 Caprylic acid also helps prevent yeast infections and the occurrence of thrush, yeast build-up in the mouth. Because an overgrowth of candida in the body can also lead to headaches, depression, and fatigue, taking NuMedica Caprylic Acid can help ward off these problems as well. Some research suggests that caprylic acid may help improve the symptoms of Crohn's Disease and even lower cholesterol. If you suffer from chronic digestive ailments or chronic yeast infections, you may want to discuss taking caprylic acid with your healthcare provider before embarking on a supplement regimen. Directions: Adults take three capsules four times daily with meals or as directed by your healthcare practitioner.